The Castle of Pieve del Vescovo (Castello di Pieve del Vescovo), massive and imposing, is dipped in the green valley dominated by the antique settlement of Corciano and is approximately a kilometer from this splendid medieval village. Evocative dwelling with masses of history, the Castle of Pieve del Vescovo is considered one of the most significant architectonic monuments to the perugino territory. The prestige of this monument is also the fruit of important historical-artistic events that took place throughout the centuries between its walls. In spite of the great value of the castle, no one cared for centuries of its preservation and just in the last decade a complete and scientific reconstruction of the building was begun. To fill the gap of this emptiness it recently appeared in a short but rich book, published by the Edilprom, that encompasses the genesis of the castle, and it describes the historical-artistic past and the constructive evolution. 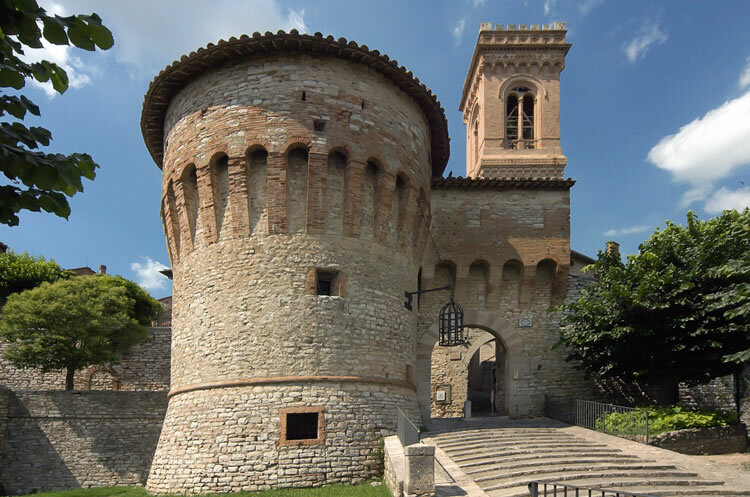 The ancient castle was constructed at the end of the XIV century around a pre-existing religious building, attested with plebs Sancti Johannis during 1206, when Pope Innocenzo III placed the castle under the jurisdiction of the bishop of Perugia. In 1394 the fortress was occupied by noble Perugian refugees and immediatly recaptured for the church by peasants guided under the "Captain of Luck", Biordo Michelotti. In 1396 the ancient pieve was walled off by permission of the Town Council of Perugia by massive walls and four cantonal towers. The 23 of June of the following year was the magnificent wedding between the victorious Captain and a noble woman, Giovanna Orsini. In the Renaissance period the majestic rampart lost all of its rigid defensive characteristics and became a refined residence with a monumental garden. Enriched with comforts and precious decorations, the complex became the favourite destination of the Perugian Bishops, who usually departed the day after the festival of saint Giovanni for long stays far away from the city. The merit of these luxurious refinements is attributed by the wishes of Cardinal Fulvio Della Corgna, grandson of the pontiff Giulio III (Giovanni Maria del Monte), that commissioned mannerist artists to decorate the rooms and the court of the castle with paintings. Continuing the Unity of Italy, due to state property laws all properties in Italy were confiscated by the government however, the castle was spared thanks to the Perugian bishop, Gioacchino Pecci. 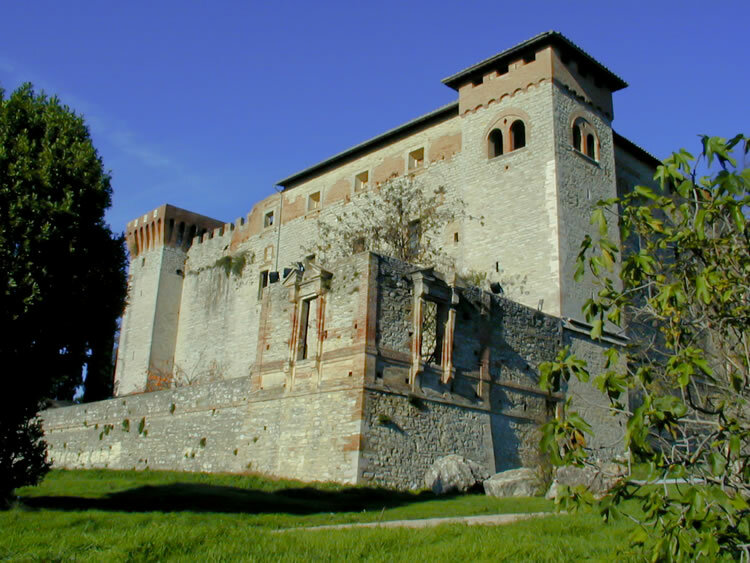 Bishop Pecci stayed at the castle periodically until 1878, the year in which he became Pope under the name of Lion XIII. The German retreat, in the last world-wide conflict, had unfortunately provoked the loss of part of the machinery building and paintings of the structure. Currently the castle, a quadrangular plant with four cantonal towers, presents itself still as massive and imposing, while to the side of the complex is situated the "House of the Pilgrim", a farmhouse partly restored, used after the acceptance by the pilgrims of passage. Etruscan period, recorded in important Etruscan period, recorded in important archaeological finding now kept in the Town Hall. In 1242 the town was a free comune, though under the political influence of the nearby, powerful town of Perugia. Typical Renaissance buildings and valuable works of art still remain in Corciano and during this period the village was a flourishing agricultural and craft centre. When it was annexed to the Kingdom of Italy, Corciano took on the political and territorial appearance it maintains to this day. Corciano still shows the features of the Medieval " castrum" and the old centre perches on a little hill, 408m above sea level, surrounded by a wall almost a kilometre in length. There were once two gates in this wall: san Francesco to the north (which no longer exists) an d Santa Maria to the south, built in the late 15th century, and still intact today. The promenade along the walls offers a spectacular view from Mt. Amiata to Mt Peglia, as far as Todi, from the Lake Trasimeno hills to Mts. Tezio and Acuto, all overlooked by the majestic Mt. Malbe. This quiet little provincial town offers visitors a peaceful stay, far from the chaos of traffic and crowds. To tourists used to large cities it may seem extemporaneous, lulled by a continual gentle Sunday afternoon atmosphere- but in actual fact the town is the heart of lively expanding activity below. Advantageously situated in the very heart of Umbria, it has easy access to Umbria's famous artistic cities – Perugia, Assisi, Gubbio, Todi, Orvieto, Spello and Spoleto – thanks to efficient road connections. Capocavallo, Castelvieto, Chiugiana, Mantignana, San Mariano, Solomeo, Migiana. Francesco Taragone da Corciano (XVI sec. ); Cocchi Pompeo (pittore, XVI sec. ); Laudati Giuseppe (pittore, XVII-XVIII sec. ); Luigi Rotelli (cardinale, XIX sec. )… and Rossella Vasta, of course!